This 2001 home has features to fulfill many interests. Located in Moore Haven on corner lot with brick walk-way and ramp to enter home. The home has a metal roof and is completely fenced with chain link fencing. Additional features include: 3 bedrooms, 2 baths (master with separate tub, shower and double vanities), guest bath has comb. tub and shower with single vanity, great room, split bedrooms, eat-in kitchen w/stainless steel appliances, dining and utility room. Kitchen and master bath have wood flooring. Outside you have sprinkler system with pump (manual) a covered gazebo with a spa and a separate deck for sitting both covered and screened. 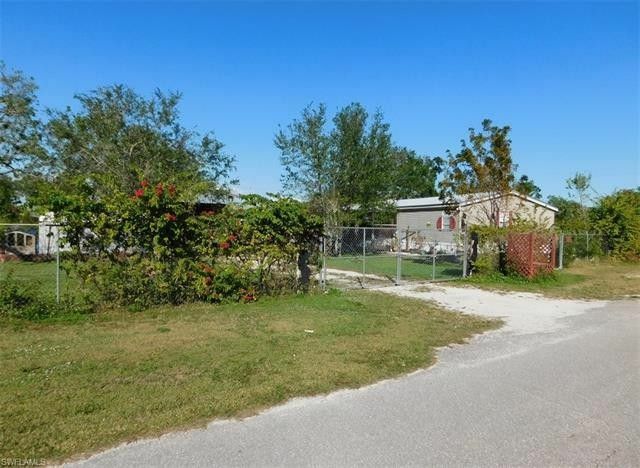 Additionally, there is a 16" x 40" (pole barn) motor-home carport with sides partially enclosed, a 16' x 20' shop, a nursery building (previously orchid house) separate storage shed with concrete floor and a beautiful yard. Also, fruit trees on property. Home is well maintained with loving care and attention to detail. If you are an active person and looking for a home, this may offer everything you would need. Also, river near-by for the fisherman. Would make a convenient week-end gateway. Above ground pool does not convey to Buyer. Directions: SR-27 Moore Haven, north on 6th St. NW, right on Avenue D NW, last home on left, corner of Ave. D and 5th St.